I am in no way an experienced self-tanner. I decided a long time ago that I found the whole process of tanning way too daunting, too easy to get wrong and so I was much better off accepting the fact that I'm pale and rocking my milk-bottle legs on nights out and holidays. 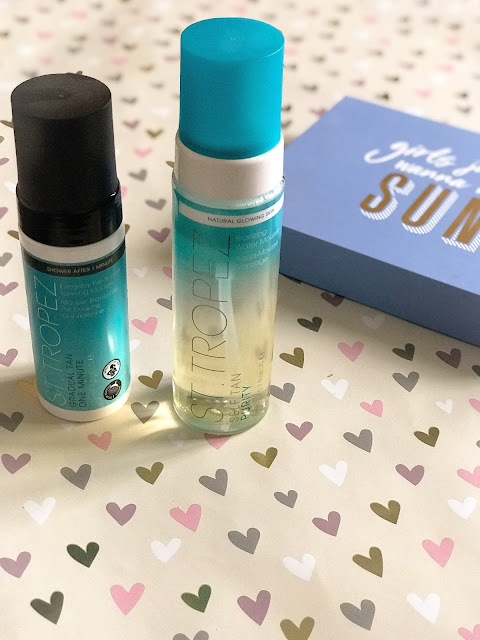 Just before I received these (very kindly gifted) products from St. Tropez, I asked a work colleague who I knew self-tanned regularly what her process was and any tips she had for a newbie. She went on to describe an elaborate, hour-long routine which included showering and moisturising beforehand, and a whole host of other steps and by the end, my head was in a spin and I had no idea how I was supposed to master such an art. Cue mild panic. 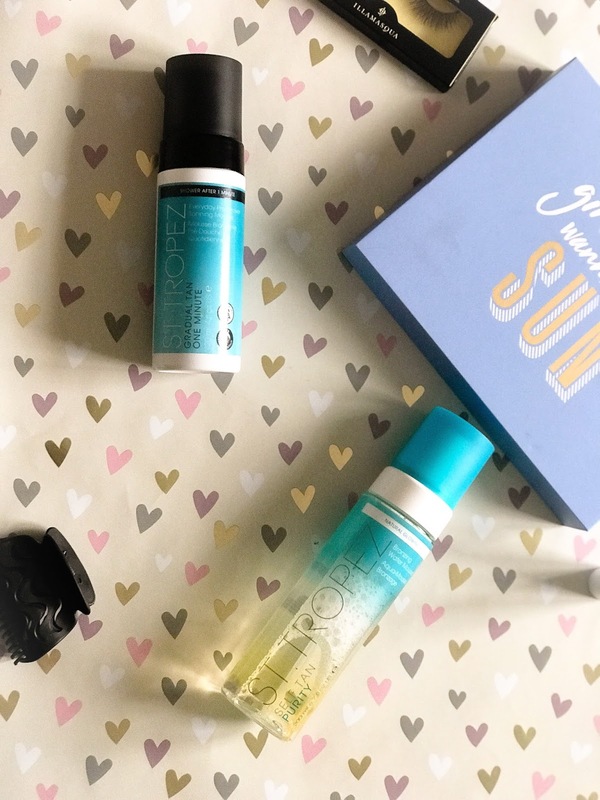 Luckily, being honest with the lovely people at St. Tropez about my barely-existent experience in self-tanning worked in my favour, because when the parcel arrived, they had picked out the two products from their new range which suited me down to the ground. The first was the Gradual Tan One-Minute Mousse. When I read the instructions, I almost cried with happiness because it was just so simple. All I had to do was apply the mousse with a mitt in sweeping motions, starting from the ankles upwards. Leave for one minute, hop in the shower and rinse. Job done. Perfect for me, partly because all fears of a complicated routine were melted away, and partly because I don't have an hour spare to go through the process, so something I can do as part of a normal morning is spot on for me. You don't see a difference instantly, but within half an hour or so you can actually see your tan building bit by bit, and it develops over the next 4-8 hours. I personally loved the results, my tan came out subtle, glowing and perfectly even. The second product I was sent was the Purity Bronzing Water Mousse. The first thing to mention is that the packaging on this product is beautiful, as well as the smell. It was a tropical scent, and while it didn't necessarily stand out as tropical, it still smelt lovely (which is refreshing when my biggest fear was smelling of biscuits). You use this in a similar way to the One-Minute Tan, apply with the mitt, and leave for one minute, making sure it is completely dry. You can then simply get dressed and go - and again the tan develops over a few hours, leaving a natural-looking radiant glow. This was actually the first product that I tested out of the two, and whilst I loved the results, my biggest tip to first-time tanners would be to make sure you get every bit of skin. I clearly got a little over excited the first time I used it, and somehow managed to miss the back of both arms! So when the tan developed, I had half-glowing, half-pasty arms. Which I had to very quickly rectify before work the next day. Oops! As a former cynic of self-tan, I have to say I have been converted. St. Tropez have convinced me that self-tanning can be easy, convenient and you don't have to smell of biscuits! These two in particular will be perfect to take on holiday, for nights out, and I've also been using them pretty regularly when I fancy a little extra glow! I'd 100% recommend these products to anyone who is new to self-tanning, or busy people who want a fast, easy routine. Bye-bye milk bottle legs! Have you ever used these products before? What are your favourite tanning products? *these products were gifted to me in exchange for a review, but all views are my own. This almost sounds too easy to be true!!! I need to get my tan on because I am crazy pale I’ve not been his white for a long time! I am always very cautious with tan because I don't want to turn out like an oompa loompa, but this sounds amazing! I used to wear fake tan ALL THE TIME when I was a teen and going into my twenties. I literally wouldn't be seen without it and I certainly had some disasters. I always put way more on than I knew I needed cos I wanted a darker tan, without any thought for whether it actually looked okay or not haha. I've tried so many different ones, all with different results but I have never tried St. Tropez! Even though I've heard it's brilliant. I love the sound of the water based one - I'd be interested to try that. I've never been one to tan, but if I see these I will consider them! I've started using my St-Tropez products again this week, I have the gradual tan moisturiser. It always takes a few times for me to get an even tan though, I'm not sure what I'm doing wrong, as it's not supposed to happen xD But I guess it's because it's not coloured, maybe I don't blend in everything well enough so I get darker streaks on my legs. But hey, I will definitely try to get my hands on these products you've mentioned! I've never tried actual self tanners before, like, with a mitt. Where did you get your mitt from?